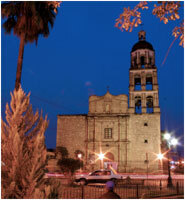 In the most exclusive area of Monclova, Hotel Chulavista has a beautiful panoramic landscape. The excellent location of Hotel Chulavista, in the heart of Monclova, gives you easy access to its facilities. We are just 12 minutes from the international airport; 7 minutes from bus station; 10 minutes from main access roads to town and only 5 minutes away from the most important industrial and comercial areas of Monclova. We offer you both tranquility and silence for your relax because we are located in the most exclusive residential zone of Monclova away from the intense traffic of the city.